Among the many diagnostic tools we have at our disposal are radiographs commonly referred to as ‘x-rays’. They include intraoral periapical radiograph and the bitewing radiograph. The use of a radiograph during a clinical examination enables imaging of the intraoral bone structure, along with the teeth it supports. Radiographs, can target acute areas of the mouth as well as provide a full mouth series of images. These images highlight the roots of teeth, as well as the crowns, providing valuable information to aid the diagnosis of common dental conditions including tooth decay, abscesses, and periodontal (gum) disease. Radiographs can also locate the presence of prior restorations, tartar, tooth fragments, as well as irregularities in oral bone anatomy. The radiography process is relatively simple for both periapical and bitewing radiographs. Below is a list of steps taken to ensure comfort and safety. Patients will sit upright in a dental chair. The radiographer will insert a film holding device into the patient’s mouth, designed for the patient to bite firmly with their teeth so as to secure it in position. This is necessary to ensure optimal image quality. Once the patient is able to hold the correct position, the radiographer will leave the room and activate the machinery used to expose the film to radiation. This process may be repeated for different areas of the mouth. We’ll then save the images, making sure that all prescribed areas of the mouth are adequately visible. Importantly, radiation exposure during the process is minimised to the greatest extent possible whilst maintaining the required diagnostic value. The level of radiation emitted from the periapical and bitewing methods of radiography is roughly equivalent to that received daily from the natural environment. Periapical and Bitewing radiographs each provide the same general value. That is, to provide our dental practitioners with an intraoral diagnostic tool that drastically increases diagnostic capability. Bitewing radiographs, usually taken in a 4 film series, provide high resolution images of both sides of the mouth, targeting the rear of the jaw from the canines backward. 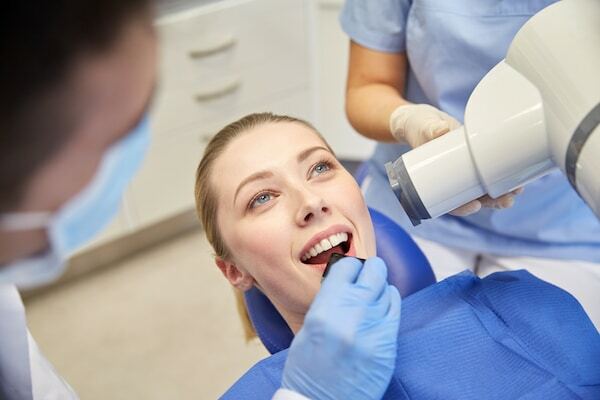 Periapical radiographs can be used to target individual areas of the mouth, as well as the full mouth, and are usually taken in a longer series. The benefits of having two methods of radiography available ultimately amounts to more effective diagnostic capability.